Rosacea is a poorly understood chronic disorder that exhibits symptoms of redness and acne-like breakouts that appear on the facial area, and less frequently, the eye, ear, chest and back areas. Perimenopausal women, fair-skinned individuals, and middle aged and older adults are the most likely to develop rosacea, although anyone can get the disease at any age. Rosacea affects an estimated 16 million Americans, the clear majority of whom are currently untreated. 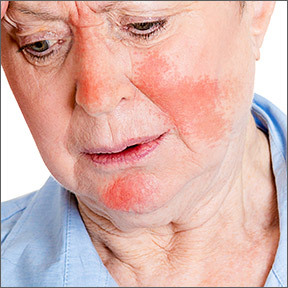 While more research is needed, studies have shown associations between rosacea and increased risk for a growing list of health conditions, including allergies, and respiratory and cardiovascular diseases, as well as irritable bowel, ulcerative colitis, and celiac and Crohn’s diseases, providing additional reasons to seek a medical diagnosis and an overall health assessment. Typically striking individuals over 30 years of age, rosacea often presents as a sudden inexplicable blush, similar to a light sunburn. Symptoms may disappear relatively quickly, only to appear again another day. Warning signs of rosacea include persistent redness on the cheeks, nose, chin or forehead, small visible blood vessels on the face, facial bumps or pimples, and watery or irritated eyes. Symptoms are known to worsen with each recurrence; the complexion tends to become ruddier, flare-ups last increasingly longer, and burning, itching, swelling and skin thickening may eventually occur. Understandably, the condition often has negative effects on emotional, occupational, and social wellbeing, from embarrassment to low self-esteem, anxiety, and depression. The cause of rosacea remains undetermined. However, people may inherit the tendency to develop the disorder. Numerous environmental and lifestyle factors are known to trigger symptoms that can last for weeks or months at a time. Common triggers include sun exposure, hot or cold weather, wind and humidity, emotional stress, alcohol consumption, hot or spicy foods and beverages, intense exercise, food sensitivities, and certain personal care products. Any activity that causes flushing or overheats the facial area, such as a sauna, a hot bath or high intensity exercise, has the potential to cause a flare-up. Although there is no cure, early diagnosis is highly recommended, as individualized treatment can help to control the condition, improve skin appearance, and slow symptom progression. Initially, an oral medication protocol or long term use of a topical cream may reduce redness and bring the condition under control. Identifying and avoiding lifestyle and environmental triggers that aggravate individual conditions can greatly improve chances of remission. A gentle, non-irritating skin care routine utilizing products formulated for sensitive skin is imperative for minimizing irritation and improving appearance. The National Rosacea Society (NRS) suggests avoiding potentially irritating ingredients, including witch hazel, menthol, and eucalyptus, as well as fragrances, astringents and exfoliating agents. The American Academy of Dermatology (AAD) recommends minimizing personal care products to those that have multiple functions, such as a moisturizer that contains sunblock. As fragrances are high on the list of irritants, AAD advises the use of fragrance-free, allergy tested products to reduce the risk of irritation. As irritants vary from person to person, testing a small amount of product on the neck area before using on the facial area is recommended. Use fingertips, not a washcloth, when cleansing the face and rinse with lukewarm, not hot or cold, water. Men can get a close shave with less facial irritation by avoiding shave creams and opting for an electric razor. An aftershave balm designed for sensitive skin can help to soothe and moisturize the skin after shaving. Nutrients and treatments that help control symptoms often result in improved confidence and enhanced self-esteem. Studies show that when fewer signs and symptoms are visible, the overall quality of life improves. Zinc 15 by Pure Encapsulations®: This highly absorbable zinc picolinate provides support for the body’s defense systems, as well as collagen formation, healthy tissue development and tissue repair. Zinc has been shown to be effective in managing dermatological conditions, calming inflammation, reducing breakouts and soothing redness. Gluten and soy free, Non-GMO vegetarian formulation. OmegaGenics® Evening Primrose Oil by Metagenics: High in naturally sourced omega-6 fatty acids, evening primrose oil helps to improve skin health, soothes inflamed skin, aids in the maintenance of healthy cell membranes, and provides support for overall health. Gluten free, Non-GMO formulation. Women’s Nutrients by Pure Encapsulations®: Designed for women over 40 years of age, this complete nutrient-rich formula provides highly bioavailable vitamins, minerals, antioxidants and botanicals to alleviate nutrient deficiencies and support overall heath and function. Pycnogenol® by Douglas Laboratories: This French maritime pine bark extract is well known for its powerful antioxidant and natural anti-inflammatory properties. Pycnogenol® helps to reduce allergy triggers, tamping down not only inflammation but histamine production as well. It binds to collagen fibers providing free radical protection and preserving the natural elasticity of the skin. Gluten, soy, dairy and yeast free formulation. Active B Complex by Integrative Therapeutics: This formula corrects or prevents the B vitamin deficiencies often seen in those with rosacea. Sufficient B vitamin intake is essential to the growth, repair and replication of healthy skin cells and healthy cellular function. Gluten and soy free vegetarian formulation. This entry was posted in Home and tagged Active B-Complex by Integrative Therapeutics, OmegaGenics® Evening Primrose Oil by Metagenics, Pycnogenol® by Douglas Laboratories, Rosacea, Women's Nutrients by Pure Encapsulations, Zinc 15 by Pure Encapsulations. Bookmark the permalink.